Vegetarian capsules are witnessing rising adoption as these types enhance formulation design in both pharmaceutical as well as nutraceutical industries. Capsule manufacturers are generating high revenues from pharmaceutical industries by providing vegetarian or non-animal capsules, with effective physiological properties such as low moisture content that is best suited for hygroscopic drug and nutrient supplements. Capsule manufacturers are generating significant revenues from nutraceutical companies by providing vegetarian capsules along with liquid filling technology. For instance, in 2015 Capsugel invested US$ 25 Mn across a number of its manufacturing sites to increase production of vegetarian capsules. Pharmaceutical industries have already started using halal-certified ingredients and manufacturing methods to cash in on the high purchasing power of Muslims in Europe. Although Muslims in Europe are fewer than in other parts of the world, their purchasing power is much higher than that of members of the community in Southeast Asia, the Middle East and Sub-Saharan Africa, with Turkey, Russia and France all figuring in the top 10 markets. In Asia Pacific countries, manufacturers have started providing HPMC capsules that are in accordance with Halal and Kosher requirements. HPMC capsules manufacturers are offering a wide range of products with properties such as gastric acid resistance, enteric coating and fast disintegration; and are also facilitating customized clinical trials to increase the revenue base. This is primarily due to customers shifting preference from or rejecting gelatin-based products that are derived from bovine hide and pork skin. However, few companies are maintaining their product portfolio with only hard gelatin capsules but not vegetarian capsules. These companies can expect robust incremental growth opportunity if they expand their product portfolio with vegetarian, marine and other plant-sourced gelatin capsules. The Pharmaceutical Companies segment is projected to expand at 10.8% CAGR over the forecast period and be valued at more than US$ 120 Mn by 2025 end. This segment is estimated to account for over 20% revenue share of the global HPMC capsules market by 2017 end but is expected to lose 23 BPS in its market share by 2025 over 2017. This segment is expected to create absolute $ opportunity of US$ 7.4 Mn in 2018 over 2017. 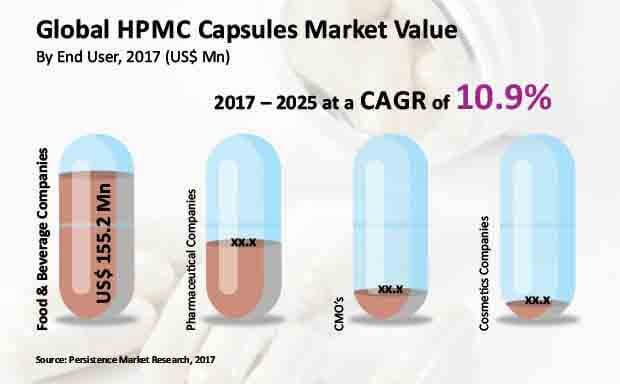 The revenue of the Pharmaceutical Companies segment in the global HPMC capsules market is expected to grow 2.2X by 2025 end as compared to that in 2017. This segment is anticipated to be the second most lucrative segment in the global HPMC capsules market by end user, with a market attractiveness index of 0.9 during the forecast period. North America and Europe are likely to be strong markets for HPMC capsules in terms of revenue share over the forecast period. Revenue growth in North America is likely to be impacted by well-defined product labeling and harmonized regulations. The Europe market is witnessing an increasing preference for capsules with clean labels and Kosher, Halal, and BSE certifications. Japan has seen an increase in the number of new clinical trials to the tune of 94% between 2006 and 2012 and this is one of the contributors of revenue growth of the HPMC capsules market in Asia Pacific. North America will continue to dominate the global HPMC capsules market throughout the forecast period while markets in Latin America and MEA will show sustained growth in the coming decade. The MEA region is a potential gold mine for HPMC capsules manufacturers owing to the increasing demand for halal certified products from Middle East countries.